33% of email recipients decide whether to open an email based on subject line alone. First impressions clearly count. When writing your subject line, keep it clear and to the point. Show candidates why your email is worth their time. As most candidates will view your email via their phone screen, being concise is especially important. So, aim for 50 characters or less. There’s a great online service from CoSchedule that can help you here. It’s a free tool that you can use to analyse your subject lines, letting you know the sentiment of your writing alongside what you could do to improve it too. When it comes to writing the email content itself, focus on simplicity. Know what you want to communicate and simply say it. Don’t cloud your messaging with clever language. Don’t use two words when one will do. Instead, focus on making the email content easy to scan. Use headings throughout, and bullet points where appropriate. In my mind, the most important part is making sure the body content aligns with the email subject line. No one likes to feel tricked so make sure you deliver on the promise made in your subject line. Personalise what you can, too. It’s not always possible to use the recipient’s first name, but always write in the second person. This helps you direct the messaging squarely at the person reading the email. It makes the candidate feel like the email is intended for them, increasing the chances they’ll interact with your agency. Make sure your branding is consistent throughout the email. Use your brand’s font, the right colour palette, and a consistent tone of voice. You want your recipients to know who the email is from at a glance. So, don’t veer from your branding in the hope of a better response. Stick to what your audience already knows and loves about your brand! When it comes to the sender name, use something familiar. Ideally, send it from a person’s actual email address as this is far more human than a ‘noreply@’ address. Plus, a personal email address is much more likely to end up in a candidate’s address book making it that bit easier to avoid the dreaded spam label. Make sure your email has a purpose and clearly state your call to action (CTA). The main thing you want your recipient to do is interact with your CTA. There are two things to consider when designing your CTA. Great design and great copy. Make sure the CTA is well designed, bold and not easily ignored. Then ensure the language you use in the CTA is action-orientated and readers can see immediately what they should do next. Whether it’s applying for a job, or reading your latest recruitment blog, make it easy for them to complete the desired next step. 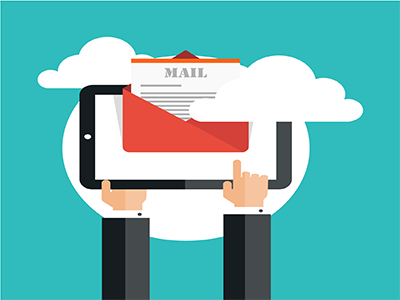 Once you’ve mastered the basics and are writing emails that connect and resonate with your audience, it’s time to think about overall email marketing campaigns. Not sure where to start? Download our new whitepaper below and get to grips with building effective recruitment email campaigns.